Spiders (order Araneae) are air-breathing chelicerate arthropods that have eight legs, and chelicerae modified into fangs that inject venom. In their bodies the usual arthropod segments are fused into two tagmata, the cephalothorax and abdomen, joined by a small, cylindrical pedicel. In all except the most primitive group, the Mesothelae, spiders have the most centralized nervous systems of all arthropods, as all their ganglia are fused into one mass in the cephalothorax. Unlike most arthropods, spiders have no extensor muscles in their limbs and instead extend them by hydraulic pressure. Most spiders will only bite humans in self-defense, and few produce worse effects than a mosquito bite or bee-sting. Most of those with medically serious bites, such as recluse spiders and widow spiders, are shy and bite only when they feel threatened, although this can easily arise by accident. Funnel web spiders’ defensive tactics are aggressive, although they rarely inject much venom. On the other hand the Brazilian wandering spider requires very little provocation. There were about 100 reliably reported deaths from spider bites in the 20th century, but about 1,500 from jellyfish stings. 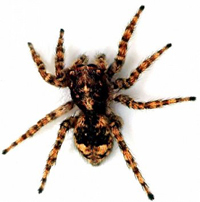 Many alleged cases of spider bites may represent incorrect diagnoses, which would make it more difficult to check the effectiveness of treatments for genuine bites. While the venom of a few species is dangerous to humans, scientists are now researching the use of spider venoms in medicine and as non-polluting pesticides. In addition, spider silk provides a combination of lightness, strength and elasticity that is superior to that of synthetic materials, and spider silk genes have been inserted into mammals and plants to see if these can be used as silk factories.